Madonna Dons North African Garb At VMA Awards : Goats and Soda Her outfit at the MTV VIdeo Music Awards was a shout-out to North African garb. What do the items symbolize? And is she guilty of cultural appropriation? 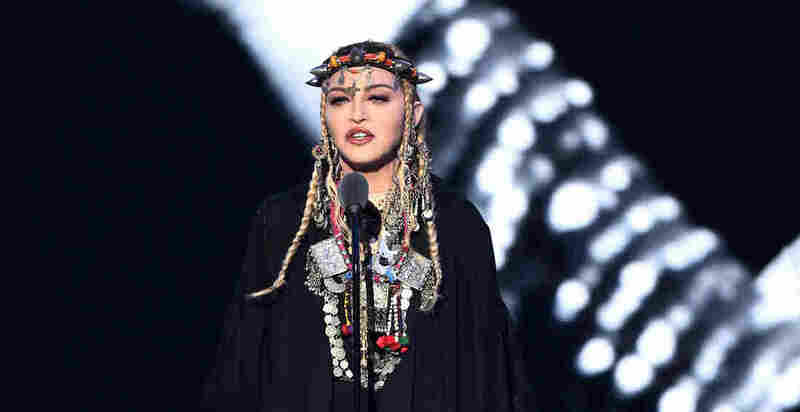 Madonna is no stranger to controversy, and she stirred it again when she showed up to the MTV Video Music Awards (VMAs) on Monday night wearing jewelry and garb from North Africa's Amazigh people. Her ensemble included a horned headdress, heavy silver necklaces and a colorful tunic, all of which can be found in shops in Morocco, where she celebrated her 60th birthday last week. The clothing and jewelry reflect the fashion of the Imazighen (pronounced ee-ma-ZEERen, the plural form of Amazigh), who live in Morocco, Algeria, Tunisia, Libya, Mauritania, Western Sahara, the Canary Islands, as well as parts of Mali, Egypt and Niger. They're often referred to as Berbers but many Imazighen consider the term derogatory – it's derived from the Greek word "barbaria," meaning barbarians. Imazighen, from their language Tamazight, means "free people." In Morocco, an estimated 40 percent to 60 percent of the population is of Amazigh descent, but only in the last couple decades has their language and culture been officially recognized and promoted by the government. That's why markets are now full of pieces like the ones Madonna was wearing. In addition to being "portable wealth," writes Courtney Stewart, senior research assistant, department of Islamic Art at the Metropolitan Museum of Art, "coins make a great noise when the wearer moves. So a group of women wearing the jewelry "would have a significant auditory component." In an email to NPR, Stewart also notes that the color red, in the coral in the headband "is sometimes associated with femininity and fertility." And the gemstones in the headband, including coral, are thought to provide baraka – blessings. Sahar Amarir, 25, is a Moroccan Amazigh graduate student who is studying Middle Eastern politics at Harvard University. She says she recognized Madonna's headdress as one worn by the Ait Baamrane tribe, which had fiercely resisted colonization.